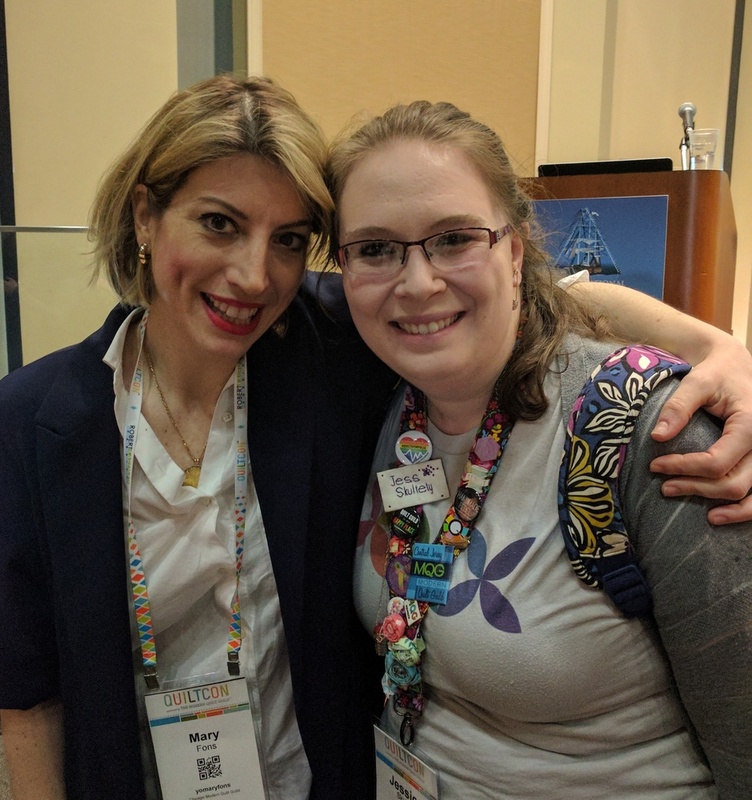 This is Part 2 of 3 of my QuiltCon 2017 Recap. b. connect with their audience. Mary did all of that with aplomb. 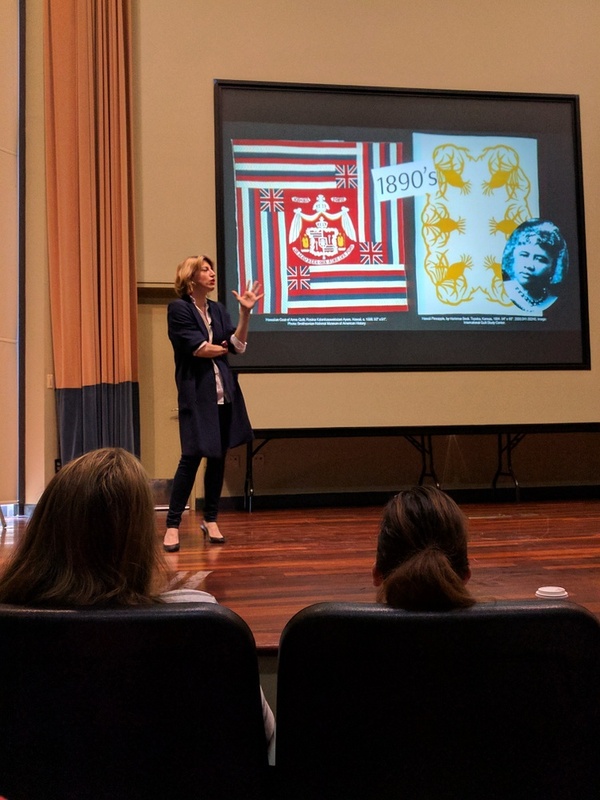 She included a "brief history" of ALL the American quilt trends she possibly could and even mentioned political quilts. Woot! At the end, I'm pretty sure we all teared up a little, as she connected all of us in the MQG with the immense and daunting history of American quilts. I really wanted to tell her how much I appreciate her writing (do you read her daily blog, Papergirl? ), and I got that chance right after the lecture. Thanks to Sarah @sarahmgoer for snapping this pic. Karen Lewis of Karen Lewis Textiles spoke about the ins and outs of screenprinting, and her love for the craft was undeniably infectious. Whenever you watch someone who has clearly found their passion in life, it's a thrill. While some of the details were lost on me (I've never screenprinted before), Karen still did a admirable job of describing everything in layman's terms. I love that she included pictures from Instagram of those who were using her fabrics, and she gave credit correctly and generously (always a plus in my book). Above, you can see Karen and Carole Lyles Shaw, our emcee, sharing one of Karen's quilts (an audience member had previously purchased and brought it in!). "How many ongoing projects do you have?" "At what point does this number stress you out?" "At what stage (binding, quilting, etc.) do you get stuck?" Cheryl encouraged all of us to embrace our unfinished projects (she has 44 - and she reported that several quilters had over 100!). You'll have to read the detailed survey results on her blog when they come out - I'll update with a link here. Finally, last but not least, I attended the keynote speech by Angela Walters. I've heard Angela speak before (at our guild several years ago), and she's a hoot - so much of a hoot that I forgot to take a picture (it was also the second to last day, and I felt myself losing QuiltCon steam at that point! I'll be honest!). 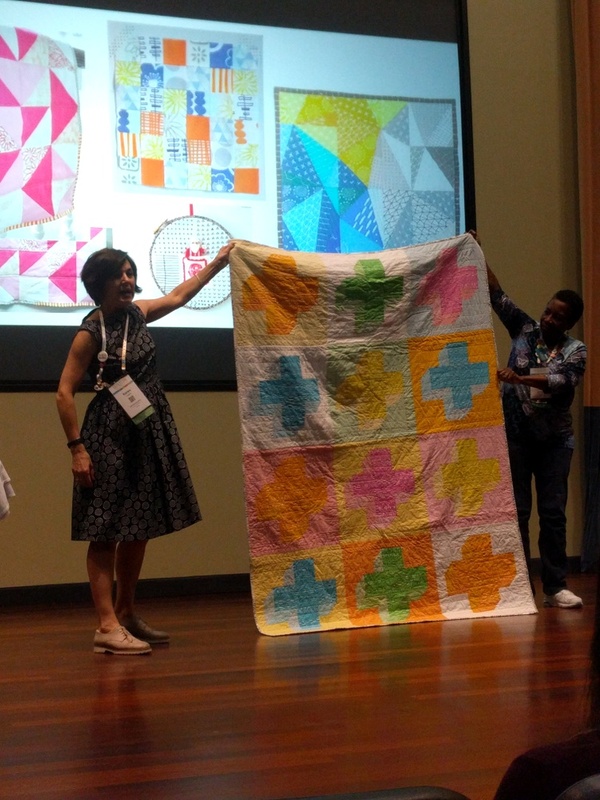 Angela talked about all the people who inspired HER to quilt and pursue her business. Her ability to connect with a wide range of quilters (style, age, skill level) was on full display. 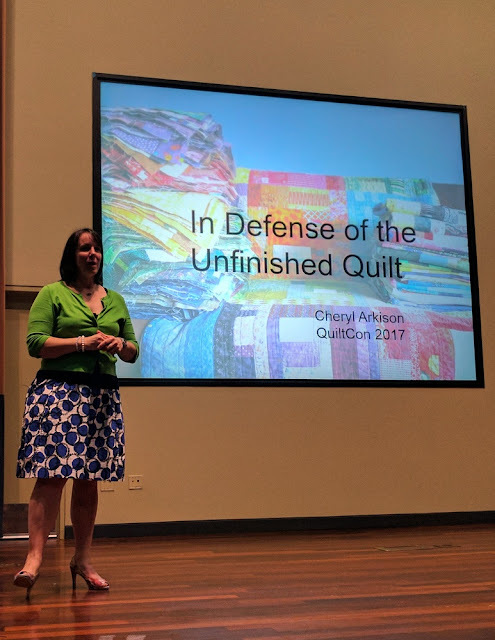 Did you attend lectures at this year's QuiltCon? What did you think? If you didn't attend, who would you love to hear from, or which topic would you like to learn more about? One of these days I would love to attend QuiltCon! I'm always so jealous seeing IG people getting to meet and hang out and I would love the chance to meet people face to face. Plus all the lectures and classes look amazing. I think I'd just want to take in everything, though I'm sure I'd be too exhausted to actually do that!